Well it seems as though something I dreamed of happening before the season started is going to become reality in the next few days, if the majority of today's papers can believed. Arsene Wenger has decided to resign Thierry Henry on a short term loan. The Daily Mail claim the news to be their exclusive but it appears to me that all of the other papers have been fed the same information. 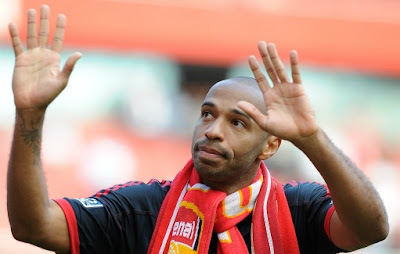 It appears talks have taken place with Henry about the possibility of a return to north London and even though he said earlier this month he didn't see a return being an option, it appears he's changed his mind. Signing Henry isn't a backwards step for me, nor will it effect the way I see him. The Frenchman is our leading record goal scorer and we have to accept he's not the player we saw in his pomp at Highbury. He's now 34 and will provide us with an option from the bench. He may even start a few games, more than likely in the FA Cup. But what he won't be is the player we saw cut through opposition teams at will and score amazing goals using his pace. What he will do is provide this squad with even more experience. He's been there and done it with Arsenal in the Premier League. What Henry doesn't know about English football isn't worth knowing. And in the weeks when he's been working with the first team squad at London Colney, Wenger has seen a player who will be able to offer us something which we are lacking at the moment. It's clear that Ju Young Park is not the answer. Marouane Chamakh is off to the Africa Cup of Nations and hopefully he'll find some form there. But apart from Robin van Persie, Wenger doesn't really have a player who can come into the team and make a difference. Henry can play as the central striker but he can also play out wide, which we've never seen Chamakh or Park do. Expectation levels of what exactly Henry can do for us have to be measured as well. You would hope that he'd be able to come on with 25 minutes to go and make an impact. What you don't want is for the crowd to be singing his name when things are going badly and for the expectation to be that he'll turn the game round single handedly. That's not the Henry we'll be signing. Whilst I think Wenger making this signing is not a bad thing, I do wonder whether it is the easy option. You would hope that this is the least worst option. When he could be signing a player as in form as Lukas Podolski, going back for Henry is only a short term option. What we probably need to do is sign a player who will bed in during the end of this season ahead of a full 2012/13 campaign. Is Robin van Persie really going to be impressed with this type of signing? Will it make him want to commit his future to the club by signing a new contract? The answer is probably no. However is Henry can help us through a difficult couple of month and keep us on track as we fight for a top four position and we end up with Champions League football at the end of the season, maybe that's not too bad an option either. Robin would rather play for a club in European football's elite competition than not. And one player who has been impressed with what he's seen of our former French captain is Per Mertesacker. "I am very happy training with Thierry. He is playing very well. It’s a great experience. "In training, he shows his class and to have him with us is great because he shows his attitude, his experience. He still has the same attitude he showed in a lot of games at Arsenal." It's good to hear that Henry's attitude has changed. We all saw in his last season at the club that he wasn't impressed with the way things were going five years ago or having to play alongside younger players who were developing their game. As long as we don't see that moody Frenchman on the pitch or hear about him having a bad attitude off it, I hope the move to re-sign him won't cause too many problems. One issue it will raise is how we fit Henry into our Premier League squad. By my poor understandings of the rules, we don't have room in the squad for Henry without dropping another player out. So who do we cut? One name being mentioned in transfer tittle tattle today is that of Tomas Rosicky. He's wanted by Olympiacos according to the Daily Mirror. Other players we could see leave thus freeing up space in the squad are Manuel Almunia and Sebastien Squillaci. A new name has been linked as a possible signing, that of Barcelona striker Isaac Cuenca. The 20-year-old is out of contract at the end of the season and can speak with foreign clubs from the New Year according to the Daily Mail. One to keep an eye on? Hopefully we'll get some more news on the Henry deal as the day progresses. Perhaps the official site might even have some team news by the end of the day... Here's hoping!